“Personal Brain” from The Brain company. Read good things about it. Trying it out, not seeing the benefits of it (yet). 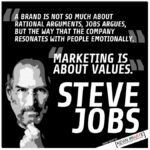 Steve Jobs on marketing & identifying your core values HBDYWI… How bad do you want it?